The days leading up to that date has overwhelmed me in so many ways. Unexpected flashbacks and vivid images have come into my mind remembering both the joyful, blessed, beautiful, happy as well as the sad times involving my daughter on that day and my long stay at the hospital carrying her inside of me while she was fighting for her dear life. 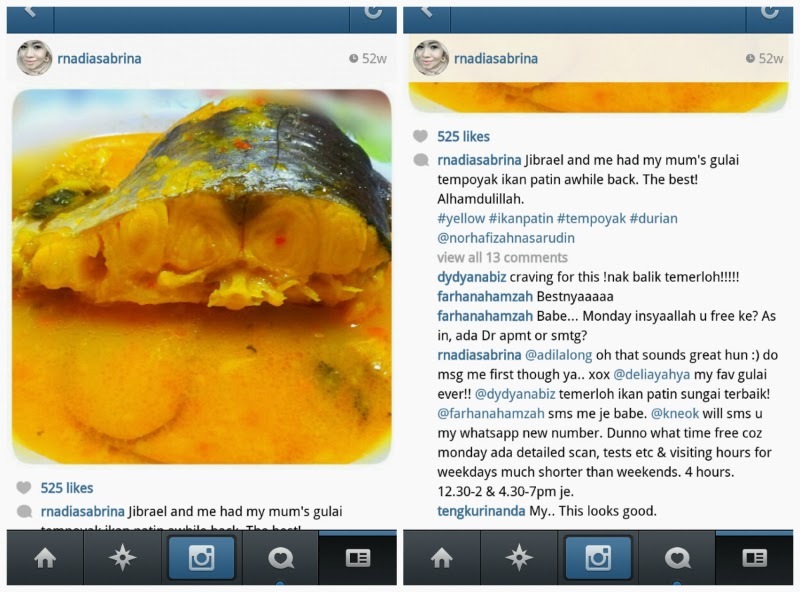 which I posted a day before my husband left KL to go to London. 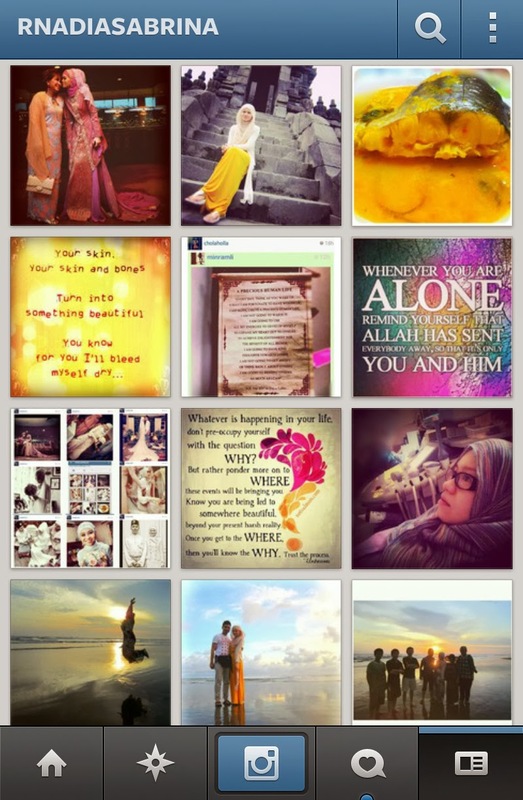 Today I scrolled down my Instagram account. Even though I remember every single post and the story behind each posts, I just feel like putting it here. in the exact order I posted them on IG just before I gave birth to Jibrael. some of my experiences leading to the day I gave birth to Jibrael in this post. in a more organised manner in the future, if God wills it. to Yogyakarta (Jogja) in early 2012 with my husband, parents and 3 younger brothers. It was one of the highlights of my 2012. It was truly quality time spent with the whole family. because he was hospitalised at another hospital at that time. and I tried my best to be positive and strong. All strength belongs to the Almighty. "if God wills it, we will have our next family holiday with Jibrael included." Now, Jibrael is having a beautiful time in heaven, she does not even need a holiday. At a place too beautiful. Posted this picture of me and the father to Putri Jibrael Zumirrah. The one who went through every single thing together with me and our child. My husband. My bestfriend. My lover. My teammate. My strongest support system. I remember I felt at peace when I posted this. I went through things I could never imagined I would be strong enough to go through. No one likes to be bedridden in the hospital. No one likes to be sick. But, at that time, carrying Jibrael and fighting for her life, I felt at ease. Even though others might choose to look at me with pity through words and actions. But, I firmly believed that God will determine what's best for all of us. but I have my family who reminded me that God will determine what's best. That was what we prayed for at that time: that God will determine what's best for all of us. So, we just try our best and the rest we leave it to God. Trust Him and His plans. No matter how bad it may look initially. I was blessed to be given the gift of carrying her, meeting her, hearing her sweet voice and holding her in my arms. I remember I was always so excited whenever we were scheduled for the scan. but I was always excited to see her growth in me. we were always glad that she was safe and miraculously growing every week. We were amazed looking at her growth every week. I am blessed to feel her moving about in me and I am blessed to have been able to keep her safe and healthy until she was ready to come into this world. Being pregnant is one of the best gifts I've ever received from the Ultimate Giver. I remember from the day I was admitted, I tried my best to be positive at all times. However, the challenge was when others see what I was doing and what I was facing as something negative. What we see as something positive, others may see it as something negative. yet people looked at me pitifully. When I was weak and down and needed to seek support and strength, some would take the opportunity to try and push me down further, intentionally or unintentionally. It's hard when you are trying your best to stay positive but others bring you down. But, then again, God tests whom He loves. "Know that you are being led to somewhere beautiful." Throughout my hospital stay, from time to time I would bleed and have contractions and have a lot of false alarms going to labour. I didn't like it whenever the doctors were concerned or suspected that I was about to go into labour. It happened a number of times during my stay. Since the very first week in November 2012. But I remember that, when I posted this, I bled a lot again. It was scary when the unexpected happened. We did not know what to expect because when it happened, it would be so sudden. It was quite traumatizing to say the least. 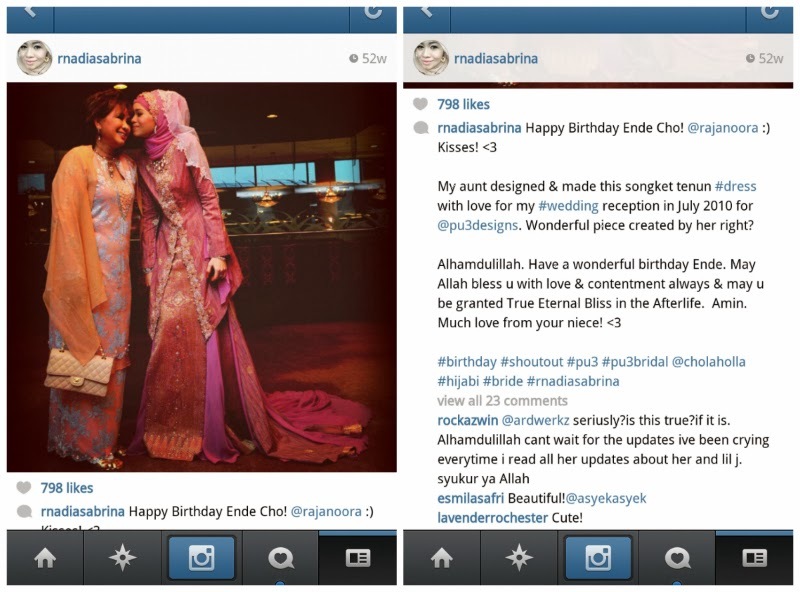 However, that day, Cho (Putri Azalea Ramli) my cousin cheered me up by spamming my IG timeline with photos of my wedding. 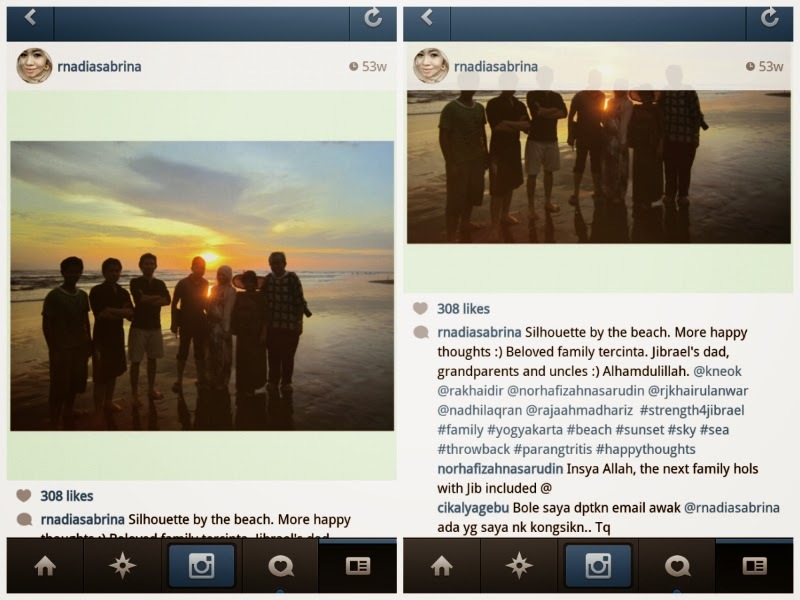 So I screen captured all of it and collaged it and posted it on my account. She helped kept my spirits up when my body was weak. I reposted this quote from Dalai Lama, taken from my cousins Min (Putri Yasmin Ramli) and Cho. I remember it took me awhile to actually listen to songs since I was in the hospital. I would usually play surah Yaseen, al-Kahf, Surah Yusuf or Surah Maryam. It is the norm for pregnant mothers. I was never like that before I was hospitalized. A lot of things I never knew and never practiced before I was hospitalized. I was ignorant about a lot of things, and still have a lot to learn. But a lot of my family members and relatives advised me to do so and it became a habit which I loved so much till I did not and couldn't listen to songs. Played and recited it from my phone iQuran Pro application. the song Yellow by Coldplay was playing in my head. All inspiration comes from the Ultimate Source of all things. I sang it to Jibrael. The lyrics hit me and touched my soul. So I used an application to write out the part which touched me the most. Never would I have thought that I was going to give birth to her in less than 2 days time. "You know for you I'll bleed myself dry." The non-stop leaking. The bleeding. I would risk my life for her. as everything revolves around her. It was only then, that I understood a parent's unconditional love to their child. The moment I was warded. to bring Jibrael out of my body. I was so moved by it. I can remember everything at that moment right up until today. It really feels like yesterday. I did not think about anything else but Jibrael. I just wanted the best for her. She was in me. I missed her as soon as they took her out of my body. I was extremely happy to see her coming out. I finally get to see her... My first daughter. The most amazing creation of the Creator I have ever witnessed with my own eyes. I was willing to die for her. 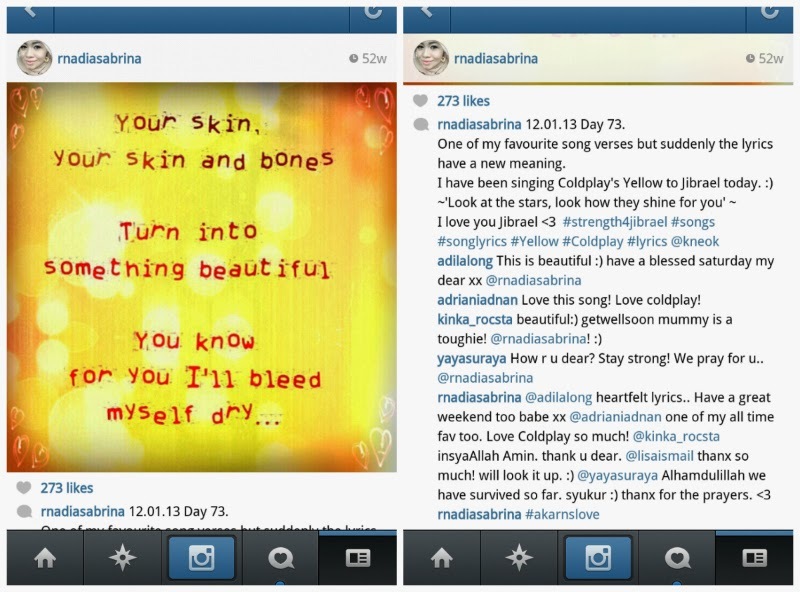 "Your skin and bones turn into something beautiful...."
I imagined it when I sang it to her. suddenly had a totally different meaning altogether at that time. With God's greatest power, I witnessed her beauty. The beauty of my daughter coming out from my womb through the emergency operation. It was the most beautiful thing I have ever seen in my entire life. The body which contained a soul which only deserves to be in heaven, nothing less. My favourite dish in the whole wide world cooked by my mother. And I shared it with Jibrael. A number of times at the hospital. My mother and my husband tried their best to satisfy cravings that I had since I couldn't eat much during my first trimester. I lost a lot of weight because of all the morning (more like whole day) sickness. But, when I do have the appetite to eat I craved a whole lot of good food mostly cooked by my mother. 80 days after my water broke. Jibrael was still inside of me. Tested at such a young age. Tested even before she was born. God tests whom He loves. The day it all began. A beautiful day it was. For me the day was filled with joy. Brighter than Sunshine by Aqualung. I sang this song happily to Jibrael when I woke up. "I look up, you're standing next to me, what a feeling." I remember I sang this part looking up at my husband while I was lying on my hospital bed. At that time, it has been more than 70 days I was in the hospital. Not seeing the outside world. Not breathing the air out of the hospital. was a feeling I could not even begin to explain. I'm yours and suddenly you're mine"
I remember that morning, my husband bought me the book Reclaim Your Heart by Yasmin Mogahed for me to read. Farhana Hamzah, her cheerful baby Yusuf Ali and Justine Shahirah visited me. Shereen Bahawi visited me again. I even had grilled lamb from Chilis which I suddenly craved that day. My last meal with Jibrael before I gave birth. But give me your hand and you will see. Your heart is keeping time with me." My finger in hers, her fingers in mine. This love will not be understood and will always be a mystery to others. A mother's love, to a child in heaven. This was my last post before I gave birth to my daughter. Dedicated to my loving aunt. She did not have the chance to see this post, I just found out. immediately when she knew I suffered from major contractions. This time it wasn't another false alarm. She stayed on throughout the night, with my mum and brother, as I was brought to the high dependency unit and later when I was in the labour room. A number of people, close family and friends helped my husband, myself and Jibrael throughout the whole fight in the hospital till now. Supported us throughout this trying time. They shared a lot of beautiful and also difficult moments with us. I will never ever forget the love all around me for Jibrael. I will never forget the beautiful moments. Etched in my heart and mind. 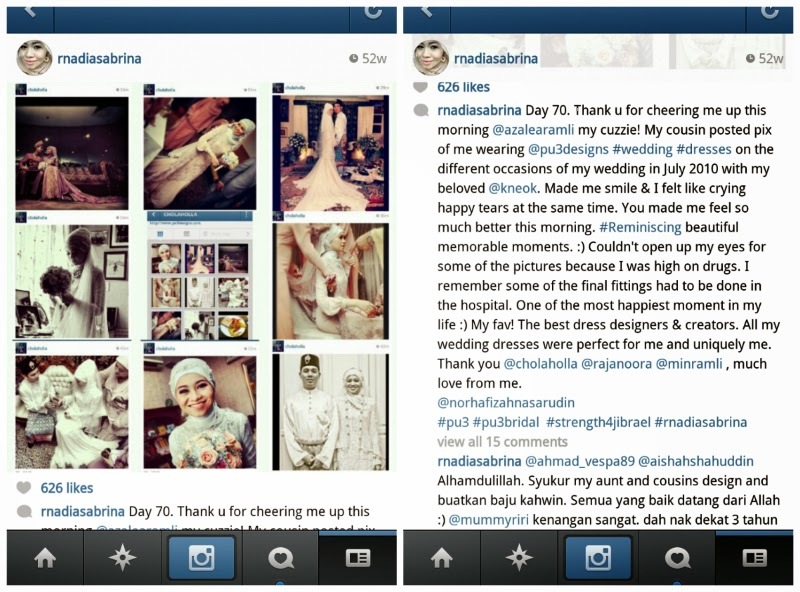 So, that's the 12 pictures I posted on IG before I gave birth and some of the story behind it. What brought me to this long post pouring my heart out? I have been feeling a mixture of emotions recently. Sometimes happy, sometimes sad and afraid. Blur and confused. I really do not know how to face this coming day. I'm excited but nervous at the same time. For that beautiful day, I suddenly had the urge to plan and invite friends and loved ones to a gathering in honor and loving memory of our daughter, Putri Jibrael Zumirrah. This gathering was about sharing the beautiful memories everyone has about Jibrael. It is not a celebration but just a way to join us to remember her life and death together with others. That idea of gathering family and friends came right after I sent my husband to KLIA for his flight to London for work last Saturday. He's still not back here yet. 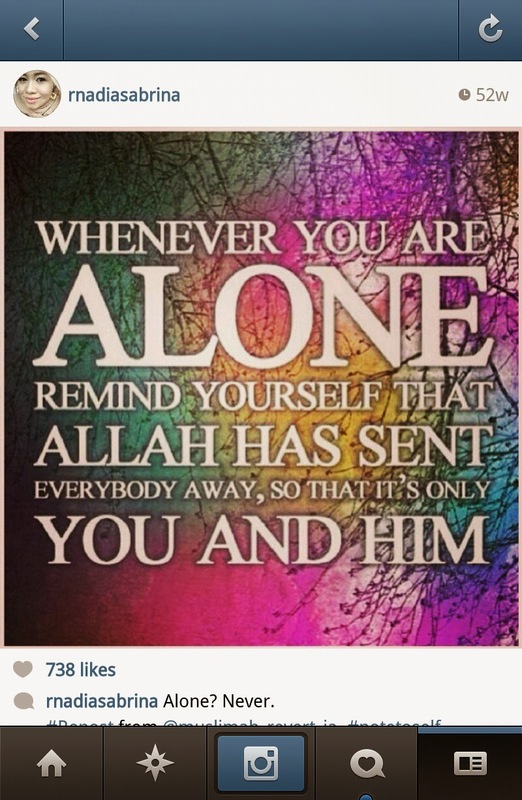 Which makes it even more difficult, as I'm here alone while he's there. A conversation with a dear friend who has so many more experiences of loss made me decide to call off the gathering on 14.1.14 yesterday. my friend told me that it would not be easy and I will not have any energy left as it will be an emotionally draining day. Deep down, I knew she was right. Even this week alone has been really overwhelming for me. An emotional rollercoaster. Something I can't explain and don't want to. The happiest day of my life was when I gave birth to Jibrael and finally got to meet her. The saddest day of my life was when she passed away. Both fell on the same day. The day she went to heaven. was born in this world and visited us briefly before she went to heaven. I myself could never have imagined how I would feel, let alone others. It is an unexpected feeling. I still have problems facing certain things, circumstances or events which I have never had any problems with before I was warded that 1.11.12. Thinking of 14.1.14 reminded me of life as I witnessed her life and of death. and death, when I held her lifeless body. God loves her more than we love her. of the beautiful moments that Monday (14.1.13) morning. only to then carry her dead body in my arms a few hours after that. but I'm reminded of this every single day. that I have to face. How can I not think of death during every birthday that I have to go through? No parent would expect to bury their child. No parent would expect to have to visit their child's grave. No parent would expect to pray for their child who is no longer in this world. her child's birthday which is the same day with the day she left this world. A normal expectation but God knows best. My daughter taught me that. I am very blessed for being able to carry Jibrael inside me. I am also very blessed to have been given the chance to meet her, to talk to her, to hear her talk to me and hold her tiny fingers in mine. Allah has blessed me by giving me the greatest blessing in my life by granting me my daughter. A daughter too beautiful for earth she had to go straight to heaven. Putri Jibrael Zumirrah made me a mother. Alhamdulillah. As you read this, do remember the life of a fighter and a miracle, our daughter. Please say a word of prayer and remembrance to her, and to us. as I would truly appreciate it from the bottom of my heart. May God reward all of you for your kindness and generosity. May we get to meet our daughter again in heaven, insyaallah. Expect the Unexpected I : The Call, the Painting, The Gift of Love, The Place & The Office. For surely You know what is hidden within. 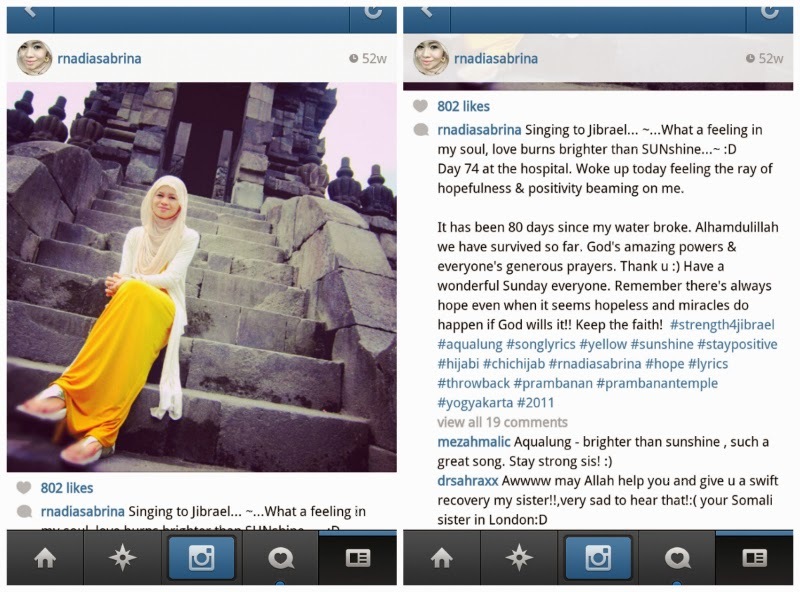 strong lady :) al fatihah for Putri Jibrael Zumirrah.. beautiful name. Alfatihah for the little princess. Praise to Allah that you are able to write everything in a very positive way. Not many people are given the abilities to pour something beautiful like this. Masha Allah. You are always in my daily dua Breen. May Allah make it easy for us to strive HIS Jannah. I burst into tears when i read this eventhough im unmarried and not a mother yet i give all my love to my niece.she is 15 months now.al-fatihah to the beautiful angel. My Akif passed away on 2.2.2013. Who knows maybe they are playing together in heaven! Ohh how I miss my little prince, and so I know how much you miss your little princess Jibrael. Cry, smile, laugh, grief...how do mothers who have lost a child explain it all? I am waiting until I see him again, even though I know the end of all time is an awfully long time to wait... stay strong Mama Jibrael. 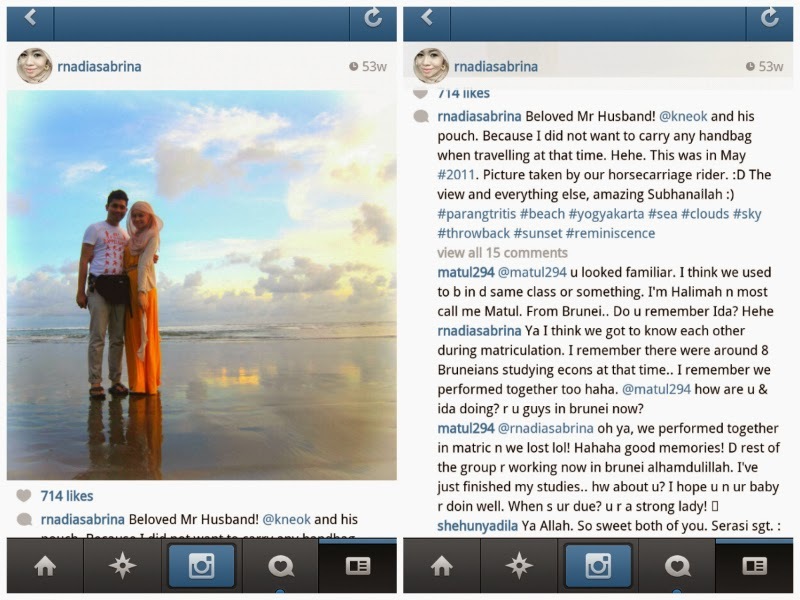 May you both be blessed..
Hope you and hubs are staying strong. Know that Jibrael never loved anyone more than she loved her mummy and daddy. :) Al-fatihah to the little one. 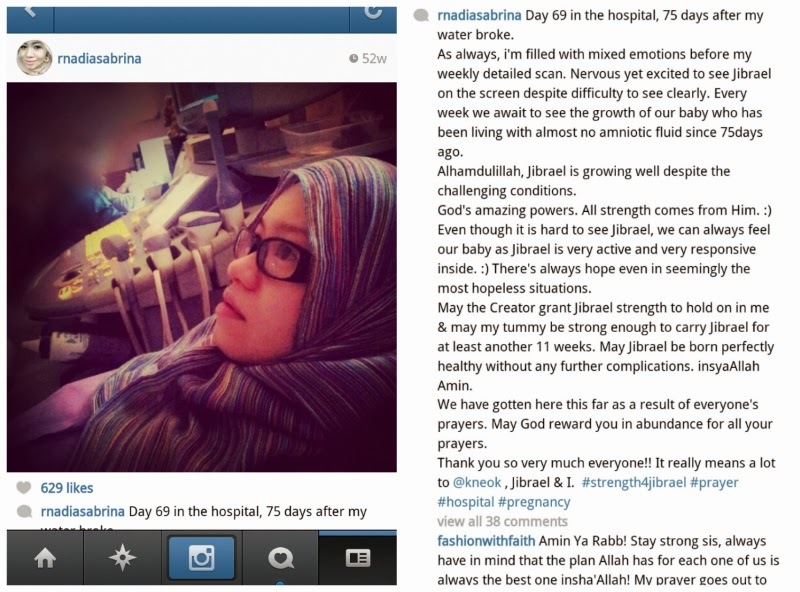 Stay strong.. Everything happen for a reason n for sure its a good one.. now u have sumone that will always pray for u from up above.. subhanallah..
Asalamualaikum nadia, I am so touch and was crying reading ur article abt Jibrael. MASYAALLAH! Im not at ur place but surely it is difficult emotionally for u n hubs. 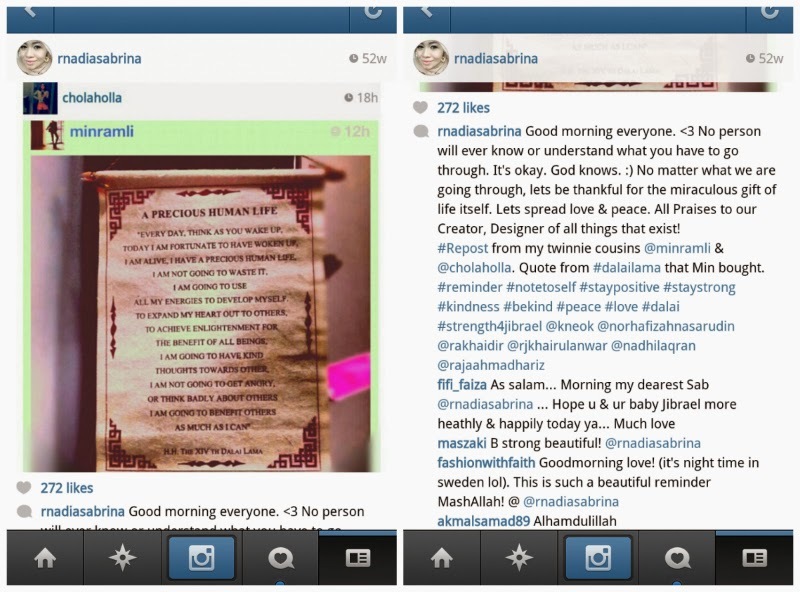 As the love for baby is uncountable... H/evr Allah will reward u more nadia. 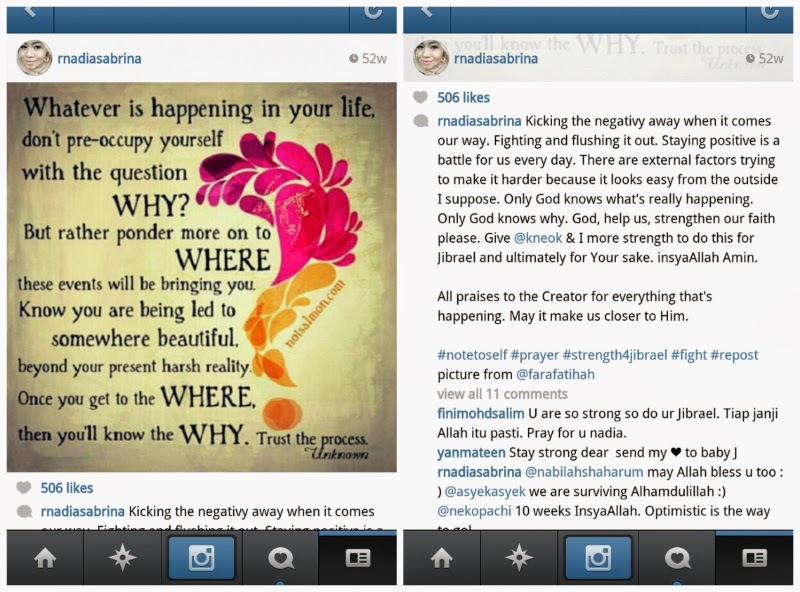 I pray for good things to happen for u. ALLAH KNOWS BEST. Tq for sharing. Your story hits a chord as a family member recently went through a sad and hard time. My cousin, who is one of my bestfriends too, just went through a hysterectomy. She had fibroid (2nd time. The 1st occurrence happened 10yrs ago). She went for a check up in dec '13 and was shocked to find out she had fibroid again. She made an appt in jan '14 to have it removed. Unfortunately the doc had to remove her womb as her fibroid was the size of a 4 mth foetus and had eaten all her womb tissues. She was devastated when the doctor broke the news to her after she came out of anesthesia. She only teared and kept apologising to her parents, in laws and her husband. It was hearbreaking to watch. She loves kids, only got married 3 yrs ago and is only 33 years of age. Which is why we cried and felt sorry for her but she did not grieve or cry her heart out. Until 2 wks after the procedure. She sobbed and sobbed and couldn't stop. We don't know the right things to say or do... but we just give her our company and love. She has her good and bad days of course. 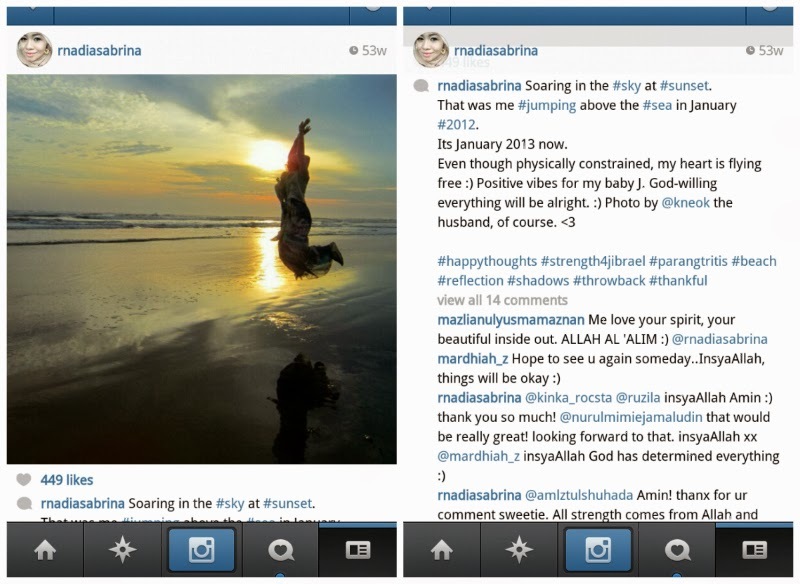 Insyallah she will find the strength to move forward. Segala ujian pada orang yang beriman, Allah akan meningkatkan darjatnya di akhirat (untuk menghapuskan dosa, etc). Dalam segala ujian, Allah akan berikan pertolongan dan kasih sayang pada umatNya. Ada hikmah dan rahsia dalam segala ujian pada diri kita. Amin. InsyAllah. GOD bless. I am sure your little princess is in a better place. Stay strong and wishing you all the best.